At City Observatory, we know that a lot of what we present is highly technical, especially when it comes to understanding the complex and dynamic problems of transportation. But when it comes to transportation policy, two of the most important lessons you can remember can be summarized in an analogy to a single beverage: the affogato. The affogato, as you know, consists to two parts: gelato and espresso. You pour a freshly brewed espresso over a healthy dollop of gelato, and there you go. To us, each of the ingredients of the affogato ties directly to a simple story about how transportation systems work. The first part of our affogato theory is the gelato, or to American tastes, ice cream. Here we have what we call our “Ben and Jerry’s Theory of Traffic Congestion,” which is inspired by this national ice cream chain’s annual practice of “Free Cone Day.” One day a year, the company gives away ice cream for free. 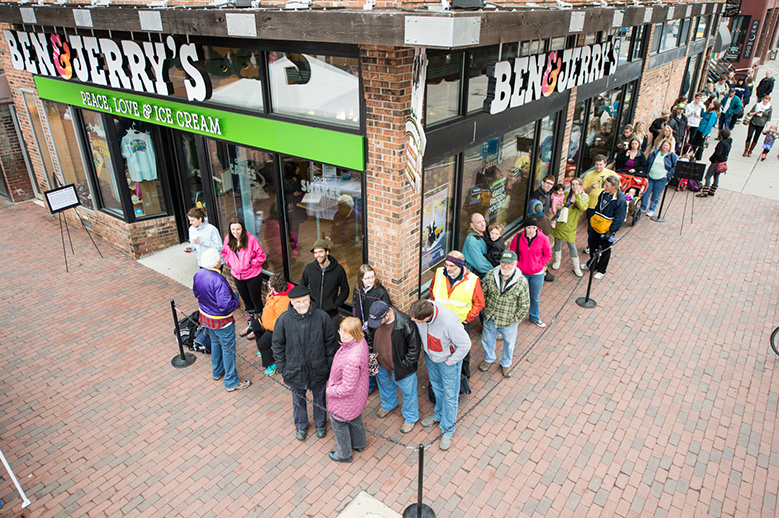 When they do, people are lined up around the block at Ben and Jerry’s stores. Long queues for a “free” ice cream cones are exactly the same as traffic congestion. The reason that people are all waiting in line is because what they’re going to consume is way, way under-priced. Peak hour road delays occur because we don’t send price signals to consumers that its really expensive to provide road capacity at rush hour. And the Ben and Jerry’s model also tells us why state and city transportation agencies are chronically short of money: if you don’t charge people for your product, especially your most expensive product, you’re going to go broke pretty quickly. Free cone day only works because Ben and Jerry hold it one day a year: your local highway department is trying to run free cone day every single day, with predictable results for traffic and their budget. The second part of the affogato is the espresso, which in this case symbolizes our Cappuccino Congestion Index. Let me explain. Periodically, you’ll read scary sounding estimates of the economic costs of traffic congestion. Typically, they’re arrived at by computing how much longer a rush hour trip takes than one taken at say, 2 am, and then multiplying additional minutes of travel by some high value of travel time, and voila, you’re into the billions pretty quickly. The troubles with this exercise, as we’ve pointed out before, are manifold, and we could point you to our 40 page critique of this research. But it’s simpler, and more memorable, we think, to point to the second part of our affogato analogy: The Cappuccino Congestion Index. If you’re like most Americans, you periodically, and often daily, patronize your local coffee shop for an espresso, a latte, or a cappuccino. If you show up at say, 8:30 am or 10 am, its a virtual certainty you’re going to have to wait in line behind others who are also looking for their morning coffee fix. 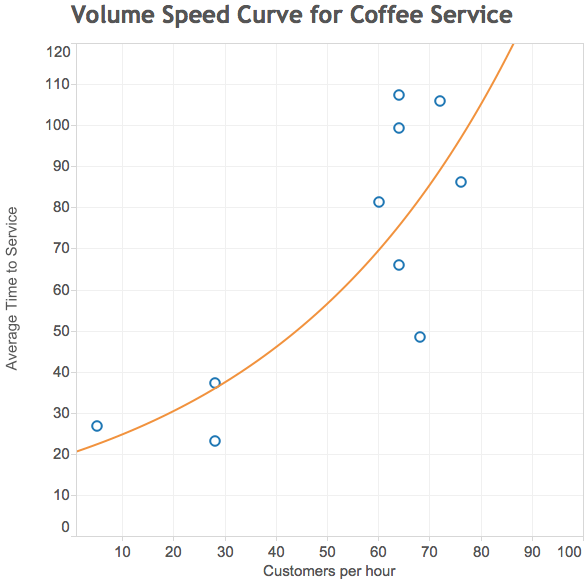 Using the same techniques that underlie the traffic congestion cost estimates, we were able to compute how much this cappuccino delay costs American coffee drinkers–it too, runs into the billions of dollars per year. But just as with traffic congestion, there’s no feasible way that Starbucks (and your local coffee shops) will hire enough baristas and buy enough coffee machines and rent large enough storefronts that you’ll have a zero wait time during peak coffee consuming hours. And as a consumer you know that if you want your coffee at the same time as everyone else, you can expect to wait a couple of minutes. It’s possible to compute how many minutes of time we spend waiting in lines (whether in our cars or not), and multiply that by a value of time and get very large numbers. But that doesn’t mean that there’s any feasible way to build enough capacity that we never encounter delays. Transportation is a complex topic. But a couple of simple parables, one about free ice cream and the other about the every morning line at the coffee shop, tell us much of what we need to know about the economics of traffic congestion. Think about that the next time you order an affogato; you’ll probably have to stand in line for a while, but it’s worth the wait.